While recent protests show that the Russian public is breaking into two camps - one pro-Putin and one opposition, is the political elite also fracturing? The large turnout at rallies both for and against Prime Minister Vladimir Putin in Moscow and other Russian cities has revealed a deep divide in Russian society. The organizers of the protests for fair elections claim that their gatherings attract members of the middle class who are dissatisfied with the powers-that-be and want to make Russia’s political system more democratic. On the opposite side, there are people who remember the turmoil of the Boris Yeltsin years and support Putin as a guarantor of political stability. It is worth noting that no members of the opposition – with the exception of the Communist Party, which has its own electorate – are promising to bridge the income gap between the wealthy and the rest of the population. The mass social movements so far there are making no claims to challenging the country’s economic and political foundations or even asserting that they are unfair, in the example of the Occupy Wall Street movement. The fact that Russians are generally accepting of the current socio-economic situation is the main point in favor of Vladimir Putin. And yet, the lack of much government opposition to rival presidential candidate Mikhail Prokhorov is an indication that the Russian political elite is not monolithic and that the divide between those who support Putin and a more liberal-minded, pro-business elite is widening. The Putin supporters are those who profited the most from the 1990s – looted the most lucrative chunks of the Russian economy, gained control of federal and local administrations, the mass media and made Russia’s current form of democracy a form of political life that preserves their power and wealth. The other, newer elite is made up of the owners of successful small- and medium-sized businesses, tech entrepreneurs, investors and others who spend large amounts of time on the Internet and now see that they will be unable to live a meaningful life until Russia gets rid of the Putin’s autocratic regime and becomes a true democracy. From this perspective, the vagaries of Russian election campaigns and the antagonistic street marchers and rallies look like overblown shows of political muscle that beat around the bush to conceal deeply rooted economic and business interests. But these economic interests are deep-seated and evidence suggests that Russia’s business heavyweights have more control over the system than political rhetoric indicates. It is hard to find a more precise, foolproof description of the Russian oligarchy’s ways than Deripaska’s frankness. His interview makes clear that Russia’s rulers have mastered the know-how of political governance that favors big business. 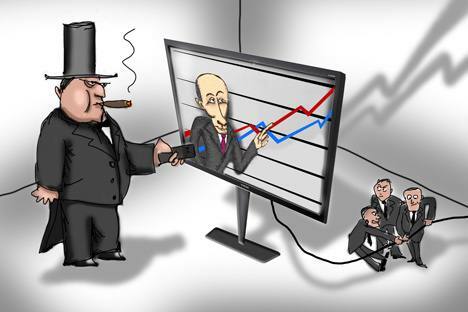 Although they lack finesse, the Russian elite’s ways of holding on to power are no less efficient than the political strategies employed by corporations in developed countries. Deripaska’s comments also show that even a prominent member of the clan of oligarchs that brought Vladimir Putin to power in 1999 is keeping his options open. In the world of business, just as in international relations, there is no such thing as loyalty. There are only interests – even more so since the interests of tycoons of Deripaska’s caliber are global and stretch beyond Russian borders. Thus, if and when political settings in Russia change, the oligarchs’ management of power and the personalities for its execution may also change. The current political situation does not yet press for changes in the rules for Russian democracy, but it may happen that after winning the presidential election, Putin and his men could be confronted a vigorous and contagious dissent – enough to make them yield political power. The collapse of the Communist regime in 1991 is the best proof that undemocratic regimes can’t last when they have exhausted the patience of the people.